Regina Hall was one of the guest presenters at the 2018 Gotham Independent Film Awards on Monday (November 26) in New York City. I understand why Regina opted for the shorter version of this Pamella Roland Resort 2019 dress, as the Oscars aren’t quite upon us just yet, but I do prefer look book version. I feel like it flows better, but that’s taking nothing away from how beautiful Regina looks here. Sparkling Louboutins, an Edie Parker clutch and Effy jewels completed her look. 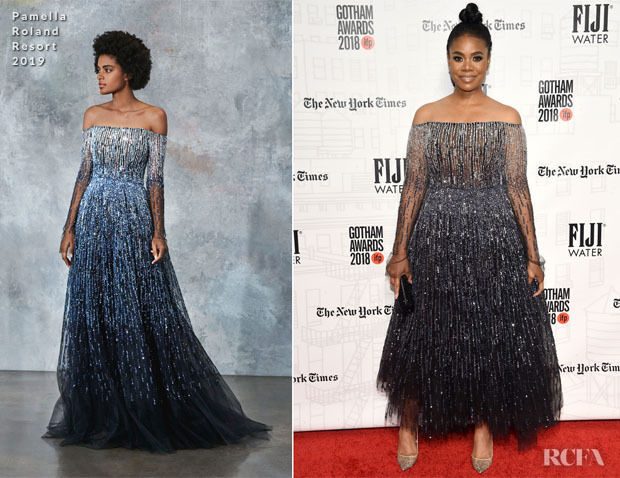 Regina Hall In Pamella Roland and Elsie Fisher In A.L.C.